Summary: The stunning debut novel from bestselling author Bill Clegg is a magnificently powerful story about a circle of people who find solace in the least likely of places as they cope with a horrific tragedy. At this year's BEA, I asked the fine folks at the Simon & Schuster booth what books they were most excited about. (I ask that terribly unoriginal question to all the publishers, but I do find it valuable!) 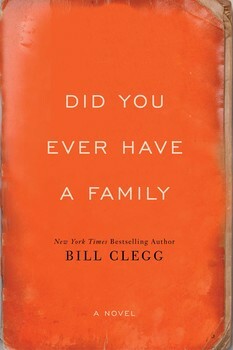 They immediately placed DID YOU EVERY HAVE A FAMILY by Bill Clegg in my hands. It's the first book from the new Scout Press imprint and Mr. Clegg's first attempt at literary fiction (he's written two critically acclaimed memoirs)... and it's an extremely special book. If I'm being entirely honest, it blew me away! DID YOU EVER HAVE A FAMILY is getting a lot of great attention. It received starred reviews from Kirkus, Library Journal, and Publishers Weekly; and it was longlisted for the 2015 Man Booker prize. I think this heap of praise is rightly deserved. Mr. Clegg is a very skilled storyteller. This novel isn't always an easy read because the subject matter is so heavy; however, it is a beautiful portrayal of family, grief, and guilt. DID YOU EVER HAVE A FAMILY revolves around one unbelievable tragedy. It's the night before June Reid's daughter's wedding, and the unthinkable happens. June loses everything -- her house, her ex-husband, her boyfriend Luke, her daughter and her daughter's fiancé. She is the sole survivor. June decides to leave her hometown and drive across the county... to a motel that her daughter had visited. The tragedy touches June's life, but it also affects many others from the owners of the motel, to the cleaning lady at the motel, to the parents of the fiancé, to Luke's mother, the caterers, and many more. This novel explores the aftershocks associated with the disaster, and each character realizes important things about the people and events in their lives. I absolutely treasured DID YOU EVER HAVE A FAMILY and didn't want it to end. I loved pretty much everything about it from the characters, to the story, to the writing. I also loved how much the story touched me while also making me think. (Again, I think that might be the best thing you can say about a book!) Despite dealing with some fairly depressing material, this novel was just a beautiful look at families and loss. There are many things that stood out to me about this novel, but I was really impressed with how Mr. Clegg chose to tell this story. The chapters rotate between over a dozen different characters, some written in first person and some in third. Each one almost reads like a short story, but their stories are linked; and some characters do appear in multiple chapters. There is little dialogue; however, the prose is rich and powerful. Without a doubt, Mr. Clegg has made a name for himself as a novelist! It's probably obvious by now that there are a lot of dark scenes in this novel. Characters not only mourn the losses from the accident, but they reflect back on other difficult times in their life. There are elements of guilt and regret that run through the story. However, I felt as if the book also provided hope. It showed the resilience of individuals and families as well as the power of friendship. Furthermore, I took away that life must go on despite everything and that healing and redemption are possible. DID YOU EVER HAVE A FAMILY would make an outstanding book club selection. Unfortunately, I wasn't able to find a discussion guide. I think I've covered many of the themes of this novel through the course of my review, so I think you have a fairly good idea of what your group could discuss. Suffice it to say that all of the characters are interesting in their own right, and that there is much to think about concerning families, grief, guilt, and redemption. I loved DID YOU EVER HAVE A FAMILY and can't recommend it enough to fans of literary fiction! I've read one of Clegg's memoirs and it was well written so I'm not really surprised to see this is so good. I can't wait to try it! Oooooh, I must, must, must get to this!! I'm very interested in trying this book. Certainly after reading all the good things about it. And life does go on - even when big, big changes happen. Thanks for sharing! I too heard about this book at BEA (and got an autographed copy there!) and have heard such amazing things about it...literally every review I've read so far has been 5 stars. I'm planning to get to it soon! And - I hope this doesn't sound creepy, but after seeing your picture on your blog, I realized that I think we were at the same Speed Dating table at BEA. Every review I read for this one seems to be in agreement, that it is wonderful. Another book to add to my list!